If a vampire doesn’t have a reflection, can I pretend I didn’t see it? Last week I had a job interview down in the city and I had some time to kill before I could catch my train. I thought, why not go to the movies and see something entertaining to pass the time. 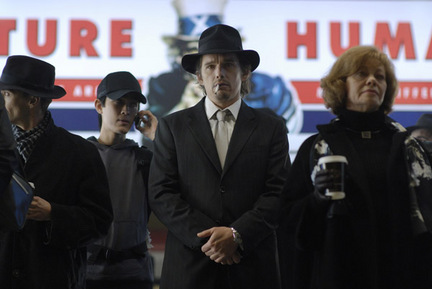 I decided on Daybreakers, the Ethan Hawke/Sam Neil/Willem Dafoe dystopian-future vampire movie. It has a future where vampires have taken over the world and a human-sympathizing vampire scientist is working to create a synthetic sustitution, yada, yada, yada. It’s story is pretty silly when you get down to it because the human population is dwindling and no one knows what to do. Like, if you hunt down and kill all the humans, then you don’t have anything to eat. You don’t need a specialist to tell you what happens when the predators outnumber the prey. But whatever. That’s not what I feel like talking about (today, at least). You see, the movie starts with Ethan Hawke’s vampire character driving his car. We see a shot of the driver’s seat from the rear-view mirror and see a floating suit and shirt in the reflection. You get it? He’s a vampire so he’s got no reflection, right? Well, this was an appreciated early tell not to take this movie seriously at all. I know, I know. It’s common legend that vampires don’t have reflections in mirrors but just think about that for a second. We are not talking about hocus-pocus Bram Stoker’s Dracula style magic vampires. We’re talking about a vampirism that attempts to mire itself into some kind of recognizable reality. Yet, when a corpse comes back wanting to drink blood, it somehow gets the ability to break fundamental laws of physics. Like, we can see the vampires so they reflect light, obviously. Their images can bounce off eyeball retinas so they are clearly reflecting off something. They show up on TV and video in this fucked up universe, so lenses and other types of light manipulation can capture them. But I try to see them with a pocket mirror, a piece of polished chrome, or a bucket of war…no dice. It’s a spooky superstitious idea but it has no place in any kind of serious vampire fiction. Just kidding. There is nothing serious about vampire fiction but you get what I mean, right? This movie introduces the novel idea that vampires love the color black. Get it...cause they're evil. I have more to say about more silly vampire cliches that Daybreakers bungles, but I’ll save it for tomorrow. The other day, I downloaded the DLC mission, “Return to Ostagar,” for Dragon Age: Origins. I had finished the game about a month ago but I wanted to satisfy my gaming itch with an old friend; namely my character with whom I had spent 70+ hours with. So, I was playing and then I decided to take a break. I left the main menu up and my wife wanders by. She offers to play my game for me, I say she should make her own character, she says she will, ha, ha. We do this sometimes. Like her Lvl 1 gnomish rogue Belly in World of Warcraft. Nina will make a character because making characters is fun but that will usually be the end of it. But it was not the end of it. About 10 hours later, Nina decided to take a break. Her city elf rogue was leveling up quickly, learning new abilities as she gathered allies to battle the darkspawn. Nina, as well, was quickly developing survival strategies and slowly mastering her WASD and mouse controls. She positioned for backstabs like a always had the right spell ready. For someone whose RPG experience didn’t go beyond Paper Mario, I was surprised how quickly she picked up how to adapted to this gaming experience. I really shouldn’t be surprised, however. My wife is excellent at puzzles and has tremendous natural aptitude at problem solving. Breaking down the best way tackle a dungeon is so completely not a big deal for someone who handles real problems on a daily basis. So, now I have this neat experience to share with my wife. Which is great…except we only have one PC in the house. So, I am typing this out furiously so my wife can have my computer back. In her defense, Ferelden is not going to save itself. Hello everyone. sorry about the mini hiatus especially after my long break. I feel like one of those TV shows that came back after being off months, then shows like three episodes, then goes off again, calling it a Winter Break or some such nonsense. Most of my lack of inactivity is certainly my fault, considering the amount of time I have at my disposal. I readily admit that. But, I’d actually like to put some well-earned blame at the feet of the software company Bioware. Why? Because their new game, Mass Effect 2 is trying to kill me. 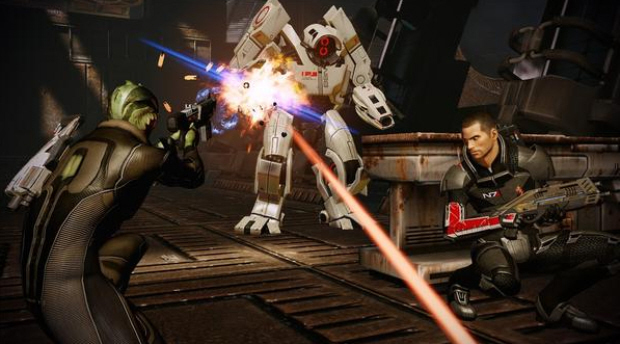 For those not in the know, Mass Effect 2 is the sequel to the excellent science-fiction roleplaying game that consumed my life a few years ago. Well, the franchise comes back with a vengeance, improving on many of its predecessor’s shortcomings and potentially ruining my life in the meantime. I won’t waste your time with a review, as there are many available on this information superhighway we all find ourselves cruising. Instead, let’s let my reaction to this game be my recommendation. Well, I bought this game last week on a Tuesday around noon and promptly put it in my XBox 360. I finished the game Wednesday evening. Upon its completion, I saw that I had put about 26 hours into the game, which did not include character deaths and the reloads that process involved. So, you may wonder where in that brief window of time did I find time to practice appropriate hygiene, eat real meals, or even sleep. Yeah, that didn’t happen so much. It wasn’t even a matter of the usual addiction, where I want to put the game down but I can’t. In reality, this was an example of a game being so much fun I did not want to stop. Basic metabolic needs were not only resisted, but completely forgotten about as I played my game. This gameplay, coupled with my current unemployment, led to the marathon session I have just described. After playing this game, I found myself disorientated by the lack of giant robots trying to kill me in real life. Okay, so that was a crazy day, but what about the rest of the week. Good question. Well, upon finishing the game, my mental and physical well-being threatened by my neglect, what did I do? Well, started all over again. So, now that I have finished it again, correcting mistakes and making different choices, I think I can really start doing other stuff in my life, like write this blog. So, yeah. It’s a good game but it almost killed me. Damn you, Bioware.